Those who have ever wondered what it would be like to walk on the ceiling need wonder no more. 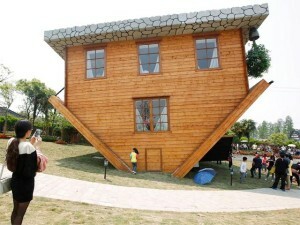 In an old town in the Shanghai suburbs sits a house that has been totally turned upside down, furniture and all. Hundreds of visitors queued for the chance pose for photos with upside-down sofas and dining tables recently, on the first day of a national holiday. And if the world being turned on its head wasn’t enough, visitors were further disoriented by the sloping floor. “I’ve felt a little dizzy since I came in. everything has been turned upside-down. It’s pretty interesting. But I think the real reason I feel dizzy is that the floor is sloping. That’s why I feel dizzy,” said 27-year-old Huang Qi. Another tourist, Sun Mingjiao, was amused by a lavatory that hung from the bathroom ceiling. “The little toilet in the bathroom made the biggest impression on me. I think its design is pretty innovative. Normal people may not think about it this way, but when I took a look at it inside, I had the feeling that water might fall out of it. It made me feel really odd,” she said. Nine-year-old Wang Yijian was still excited by the experience as he played outside afterwards. “I felt like I was standing on the ceiling. The house is upside-down, but I still didn’t fall off,” he said. Designed by a Polish designer and funded by a Polish company, the construction of the house started in November, and took five months to complete. It opened to the public on April 25 and costs 30 yuan ($4.79) per visit. Has Apple maps found the Loch Ness Monster? Since its inception in the sixth century, the legend of the Loch Ness Monster has endured unreliable sightings, doctored photos and faked footprints, but a mysterious satellite image has given fresh hope to believers of the elusive Scottish sea creature. 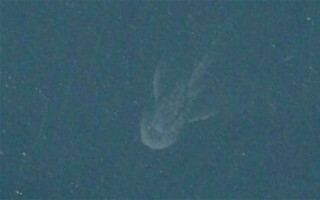 The image, taken by an Apple map satellite, depicts a shadowy form of around 100 feet in length with something akin to flippers in the water of the Loch Ness. “We’ve been looking at it for a long time trying to work out exactly what it is,” Gary Campbell, president of the Official Loch Ness Monster Fan Club, told the Daily Mail. After studying the image for six months, and with apparently no other obvious explanation, the Club has concluded that shadow is probably the Loch Ness Monster. “Whatever this is, it is under water and heading south, so unless there have been secret submarine trials going on in the loch, the size of the object would make it likely to be Nessie,” Campbell said. One of the spotters, 26-year old Andrew Dixon from Darlington, said: “It was a total fluke that I found it. I was looking at satellite images of my town and then just thought I’d have a look at Loch Ness. This supposed sighting is the first reported in 18 months, the longest that Nessie has been missing since 1925. All three sightings of the monster in 2013 were found to be fake – one was a duck, one was a wave and one wasn’t even taken at Loch Ness. The paint contains a “photo-luminising” powder that charges up in the daytime and slowly releases a green glow at night, doing away with the need for streetlights. The technology was being tested with an official launch targeted for late April. 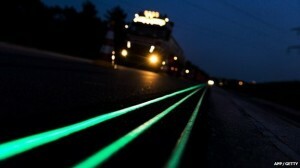 It is the first time “glowing lines” technology has been piloted on the road and can be seen on the N329 in Oss, approximately 100km south east of Amsterdam. Once the paint has absorbed daylight it can glow for up to eight hours in the dark. “If we put this technology on all unlit roads that would be a lot of kilometres and it would be a big investment so if safety improvement is the target then we need hard evidence about how this compares to what we already have and to back up any safety claims,” he said. The UK Highways Agency said it was watching the trial in the Netherlands with interest but said that previous studies had shown that “luminescent road paint would be unsuitable for use in this country”. It said it would take several things in to account when deciding whether to include luminescent road markings in its design standards. These would be include how far in advance road markings could be seen, how skid resistant they were, how visible they were during the day and how they would perform in winter when there are fewer hours of daylight. Initially the team also had plans to develop weather symbols that appeared on the road once the temperature reached a certain level. A temperature-sensitive paint mixture would be used to create giant snow flake-shaped symbols on the tarmac to warn users that the road may be icy. The current stretch of glow in the dark road in Oss does not include this temperature sensitive technology. It is a pilot project at this stage and is expected to expand internationally later this year. Dutch media report that Heijmans is keen to use the paint on other roads but has not yet negotiated any contracts. He understands [a few words] of Chinese, but that has not stopped Patrick Veisselier performing a stand-up routine in Mandarin that has Chinese audiences in stitches. And it is not just his pronunciation that they are laughing at. Mr Veisselier’s 90-minute one-man show in Paris has been playing to packed houses. Most of his audience are ethnic Chinese born in France, which has one of Europe’s largest Chinese communities. 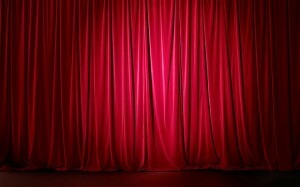 The blue-eyed, round-faced 41-year-old from Lyon, France, learns his gags by heart, but he also uses a teleprompter, with the script written out phonetically, in case he forgets his lines. The audience can read the jokes in both French and Chinese on a giant screen behind him. He said he came up with the idea after a Chinese friend told him that China had hardly any comedians, while there were a lot in France but their jokes did not often make Chinese people laugh. Mr Veisellier worked with Chunjuan Jia-Sauvage, a bilingual Chinese French woman, to produce a script in Mandarin. Apart from the occasional one-liner in French, the show is all in Chinese. He has never visited China, but plans to take the show there in three months. He says he is now going to learn the language seriously, rather than just for laughs. From London’s Daily Telegraph and BBC News.